Shteyngart, after all, emigrated with his parents to America as a child; beneath his trademark satire lies the earnestness of someone who became a citizen. By the end of Lake Success, Shteyngart should convince most of his readers of the enduring viability of the cliched "on the road" plot; he should also convince us (if, indeed, we need convincing) of the enduring viability of our greatest national cliché: that is, the promise of America. The anti-hero of this tale is Barry Cohen. You've met his like before, most notably in Tom Wolfe's iconic 1980s novel, The Bonfire of the Vanities. Barry, like Wolfe's Sherman McCoy, is a master of the universe who's discontented with the life he's worked so hard to attain. Barry grew up in Queens, a social misfit who practiced "friend moves" in front of the mirror until he'd remade himself into a popular kid and went on to conquer Princeton and beyond. But, now, the feds are investigating Barry's financial deals at the same time that his marriage is fracturing. Barry Cohen, a man with 2.4 billion dollars of assets under management, staggered into the Port Authority Bus Terminal. He was visibly drunk and bleeding. There was a clean slice above his left brow where the nanny's fingernail had gouged him and, from his wife, a teardrop scratch below his eye. It was 3:20 a.m.
Barry has just had a nasty tussle with his wife and nanny after he tried to force Shiva to speak. Now he's exiting his former life — via Port Authority, not private jet — because he's impetuously made the decision that he wants to travel like he did in college, when he last rode Greyhound to visit his old girlfriend in Virginia. He wants to find her again. As much as this novel references Kerouac's On The Road, it also nods to The Great Gatsby — and we know how well that effort to "repeat the past" turned out. On his long bus odyssey, traveling from New York to Richmond to Atlanta to El Paso and, finally, to the promised land of California, Barry, in Lear-like fashion, sheds his cell phone, his money and his suitcase filled with his beloved vintage watch collection; in return, he gains a giant rock of crack cocaine and bragging rights to some deeper self-knowledge. Shteyngart's writing rises to the challenge of seeing America by Greyhound, starting with the inside of the coach as it rumbles through the night from New York towards Trenton. Passengers, we're told, "were snoring like they had entire planets up their noses. ... The PA system didn't work, but it emitted a staccato ghostly sound. ... Perhaps it came from the souls of former passengers who were still trapped aboard. This isn't just any misbegotten magical mystery tour that Barry is taking; this is a cross-country bus ride set during the summer of 2016. Trump and his vision of America are implicitly interrogated at every pit stop along the way. Meanwhile, back in New York, his wife Seema embarks on an affair with a neo- Guatemalan novelist named Luis who describes his books as "basically all the same ... American colonialism, crimes against the indigenous, yada yada yada." Shteyngart's take on America on the verge of a Trump presidency is anything but yada yada yada. His comic view of the country is, by turns, compassionate and mournful; wickedly satirical and ultimately, aspirational. He captures what one of his own favorite writers, Philip Roth, once called "the indigenous American berserk" but he's not, in turn captured and disfigured by it. He imagines that there might yet be another fork in the road, another highway rest stop, another snoring American right beside you, dreaming their own great American dream. This is FRESH AIR. 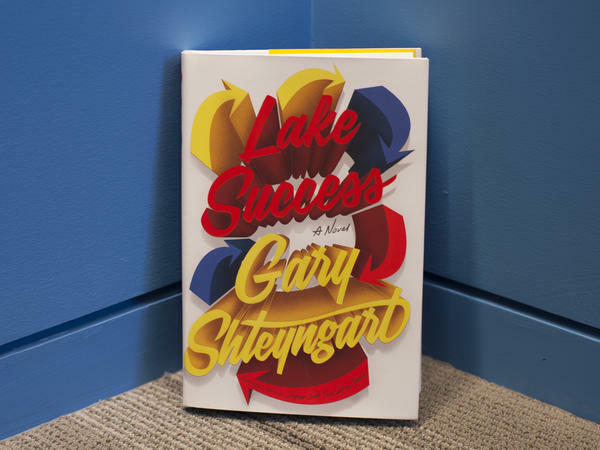 The first big book of the fall publishing season is Gary Shteyngart's novel "Lake Success," and our book critic Maureen Corrigan says it's a winner. Here's her review. MAUREEN CORRIGAN, BYLINE: There's life in the old road trip saga yet. That's just one of the many things that Gary Shteyngart's spectacular, sprawling new novel, "Lake Success," affirms. Throughout his career, Shteyngart has proven himself a cheeky comic daredevil but never more so than in this novel. More than just an artistic tour de force, "Lake Success" aims and succeeds in saying something big about America today. Shteyngart, after all, emigrated with his parents to America as a child. Beneath his trademark satire lies the earnestness of someone who became a citizen. By the end of "Lake Success," Shteyngart should convince most of his readers of the enduring viability of the cliched on-the-road plot. He should also convince us, if indeed we need convincing, of the enduring viability of our greatest national cliche - that is, the promise of America. The anti-hero of this tale is Barry Cohen. You've met his like before, most notably in Tom Wolfe's iconic 1980s novel "The Bonfire Of The Vanities." Barry, like Wolfe's Sherman McCoy, is a master of the universe who's discontented with the life he worked so hard to attain. Barry grew up in Queens a social misfit who practiced friend moves in front of the mirror until he'd remade himself into a popular kid and went on to conquer Princeton and beyond. But now the feds are investigating Barry's financial deals at the same time that his marriage to a gorgeous Indian immigrant named Seema is fracturing. Adding to the stress is the fact that their young son, Shiva, has been diagnosed with severe autism. What's a Wall Street titan to do when the walls close in? Make a run for it of course. Here's the opening of "Lake Success." (Reading) Barry Cohen, a man with $2.4 billion of assets under management, staggered into the Port Authority bus terminal. He was visibly drunk and bleeding. There was a clean slice above his left brow where the nanny's fingernail had gouged him and, from his wife, a teardrop scratch below his eye. It was 3:20 a.m.
Barry has just had a nasty tussle with his wife and nanny after he tried to force Shiva to speak. Now he's exiting his former life via Port Authority, not private jet, because he's impetuously made the decision that he wants to travel like he did in college, when he last rode Greyhound to visit his old girlfriend in Virginia. He wants to find her again. As much as this novel references Kerouac's "On The Road," it also nods to "The Great Gatsby," and we know how well that effort to repeat the past turned out. On his long bus odyssey, traveling from New York to Richmond to Atlanta to El Paso and finally to the promised land of California, Barry in Lear-like fashion sheds his cell phone, his money and his suitcase filled with his beloved vintage watch collection. In return, he gains a giant rock of crack cocaine and bragging rights to some deeper self-knowledge. Shteyngart's writing rises to the challenge of seeing America by Greyhound, starting with the inside of the coach as it rumbles through the night from New York towards Trenton. Passengers, we're told, were snoring like they had entire planets up their noses. The PA system didn't work, but it emitted a staccato, ghostly sound. Perhaps it came from the souls of former passengers who were still trapped aboard. This isn't just any misbegotten magical mystery tour that Barry is taking. This is a cross-country bus ride set during the summer of 2016. Trump and his vision of America are implicitly interrogated at every pit stop along the way. Meanwhile, back in New York, Seema embarks on an affair with a neo-Guatemalan novelist named Luis, who describes his books as basically all the same - American colonialism, crimes against the indigenous, yada yada yada. Shteyngart's take on America on the verge of a Trump presidency is anything but yada yada yada. His comic view of the country is by turns compassionate and mournful, wickedly satirical and ultimately aspirational. He captures what one of his own favorite writers, Philip Roth, once called the indigenous American berserk. But he's not in turn captured and disfigured by it. He imagines that there might yet be another fork in the road, another highway rest stop, another snoring American right beside you dreaming their own great American dream. GROSS: Maureen Corrigan teaches literature at Georgetown University. She reviewed "Lake Success" by Gary Shteyngart. Tomorrow on FRESH AIR, my guest will be former Senator and Secretary of State John Kerry. He's written a new memoir about his service in Vietnam, how he became an activist against that war and how his service was used against him with a smear campaign when he ran for president. And of course the book covers his years as senator and secretary of state. He was instrumental in the nuclear treaty with Iran and the Paris climate accord, treaties which President Trump pulled out of. I hope you'll join us. We'll close with music by Randy Weston. He died Saturday at the age of 92. Weston was an American jazz pianist whose music was heavily influenced by traditional African music as well as by Thelonious Monk and Duke Ellington. This is his best known composition, "Hi-Fly." (SOUNDBITE OF RANDY WESTON'S "HI-FLY")[POST BROADCAST CORRECTION: In the audio of this review, we state Seema is an immigrant. In fact, she is the daughter of immigrants.] Transcript provided by NPR, Copyright NPR.